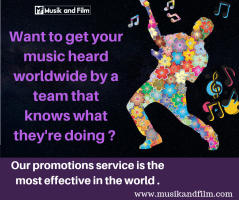 Want to get your music heard worldwide by a team that knows what they’re doing? We digitally plug your music up to 250,000 stations in 180 countries. Our radio plugging service is the most effective in the world. See below for packages and pricing. Submit your mp3 below for consideration and you will be contacted ASAP! Thanks for your interest in Musik Radio Promotions. Using our submission form, send us a sample of your music along with your information. Make sure to provide a way to contact you. After receiving and reviewing your music, we will contact you for a free consultation. Once we determine your promotions package (scroll down for packages and pricing), we will build your personalized DPK and provide you with a 24/7 real-time tracking link. At Musik and Film, we deliver what we promise, and we promise industry-leading results that empower Indie Artists. Sales gimmicks and tricky contracts are not what we’re about. What we say we will do, we do, and we’re good at it. Our reputation and customer testimonials speak for themselves. With some other promotion services, you’re often just another customer waiting in line with a credit card. Musik Radio Promotions stands out from the rest because we personally work with you every step of the way to create a custom promotions package that fits just you. And if you have any questions along the way, we’re always just a phone call or email away. With radio promotion to 180 countries and over 250,000 stations, no other promotions service comes close to our target audience size. Our station database has been carefully developed through years of nurturing relationships of trust with radio programmers who know they can rely on Musik and Film to send them quality music. That means more listeners and fans for you. We supply artist with their own private link to view radio station downloads & streams at anytime for the life of the single averaging 3 months or more. This gives you full visibility into how your promotions campaign is doing. President of Musik and Film Stephen Wrench has over 40 years of experience in every facet of the music industry as a singer/songwriter. He was also former VP of a major label, a producer, and a manager. He has earned the respect of his peers, becoming a nominating and voting member of the Grammy Awards. Stephen and his team know how to design a music marketing plan specifically for you to get your music heard. We know from experience what radio wants to play. With our state of the art studio equipment and platinum level producers, we can provide the production work necessary to optimize airplay of your music. Having worked on over 60 platinum albums, we know exactly what is required for successful radio promotion. Digital promotion is essential for reaching Radio DJ’s and listeners. We don’t blast your music to a database of random stations. Instead, we provide custom Digital Press Kits (DPK’s) that are genre and location specific. Your music is custom delivered in seconds across the globe to thousands of stations matching your target locations and genres. This translates into a high success rate of your music being heard. 3 Month Promotion Your song will be actively promoted to every station in your genre to in 180 countries. We promote to over 250,000 stations worldwide. Active promotion lasts 3 months. In most cases they will be playing your music for many months after the promotion period. Tracking Link Every artist receives a private link with real-time stats of radio station streams and downloads of their music. You'll know exactly when, where, and who listens to your music. Available 24/7. Digital Press Kit A custom press kit is created for each artist which includes an album cover, links to your personal sites, radio promos, and a brief bio. All of these are custom created and reviewed with you before sending. EIMC Top 200 The European Indie Music Chart is an international chart. The European Indie Countdown Show is broadcast on over 700 stations in 30 countries. All world package clients are guaranteed top 20 placement on this chart. EIMC Countdown Artists will be in the Top 20 and may be asked to be on the weekly countdown show. Professional Article All of our packages include a professional write up for your use as a press release or website article. Personal Artist Page Every promoted artist receives a free professional artist page on our website featuring your music and biography. 5 Magazine Reviews Every artists receives magazine reviews in five of the following magazines: Indie Music Review, Vents Magazine, Skope Magazine, Band Blurb, Da Hip Hop Place, Artist PR, Gashouse Radio, Carlito's Music Blog, Valhalla Music Blog, and Razorfish Reviews. 8 Week DRT In addition to Musik Radio's own powerful promotion system, all artists promoted in our Premium and Plus plans are promoted for 8 weeks through the Digital Radio Tracker system. DRT Tracking Report In addition to Musik Radio's own real-time tracking reports, all artists promoted in our Premium and Plus plans receive weekly reports from the Digital Radio Tracking system. Artists will chart at http://www.digitalradiotracker.com/chart.html. Top 40 and top 10 placement is guaranteed. Top 50 Charting Our Premium and Plus customers are guaranteed placement on the National Airplay Top 200 Chart. Premium customers are guaranteed to be in the Top 40 and Plus customers the Top 10. Guaranteed Spins Basic customers are guaranteed at least 5,400 spins, Premium 9,400 spins, and Plus 13,400. Top 30 Charting Our Premium and Plus customers are guaranteed placement on the National Airplay Top 200 Chart. Premium customers are guaranteed to be in the Top 40 and Plus customers the Top 10.